Choosing a wedding dress is difficult because it would be the most significant dress you will ever wear in your life. You want to grab the eye of your guests with the magnificent attire. The process of choosing a wedding dress becomes difficult partly because you don’t have any previous experience in buying or wearing a wedding dress before. The common popular wedding dress is not the same everywhere. It changes based on culture, faith and region. According to fashion designers and wedding planners in Chennai, lehenga is the most popular bridal dress in Chennai. Lehenga can add grace and elegance to the attire of brides. If you are from Chennai, most probably you would want a lehenga as your bridal outfit. One you have decided your bridal dress, you may want to visit all stores and find out the best dress for you. There are hundreds of shops selling lehengas in Chennai and some of them have amazing collections while some other sell mediocre products. You don’t want to visit such mediocre shops and waste your valuable time. We have picked a few shops in Chennai that are popular and sell best quality bridal lehengas. Rangoli is a pioneer in designer saris and lehengas and it has stores in several major cities in India. Its store in Nungambakkam, Chennai is a one-stop solution for all bridal dresses and it has a wide range of selections of lehenga, sari and gown in mesmerizing colors, designs and styles. This store is situated in at Tirumurthy Nagar in Nungambakkam. Kalanikethan is a legacy in fashion and has tons of bridal lehengas with magnificent and high-class designs. This store is very convenient for shopping. Kalanikethan has lehengas in the best and latest designs. Their dedication to the customer satisfaction in their service set them apart from their competitors. In Kalanikethan, you can choose bridal lehengas from a huge selection in different designs and styles. This is probably one of the best among the lehenga shops in Sowcarpet, Chennai. This store has a wide range of embroidered and fancy lehengas in their collections bridal wedding dress collection. In Kataria’s you also have the option of customizing your bridal outfits based on your personal requirements. If you are a retailer and looking for the best wholesale suppliers of bridal lehengas in Chennai, Rajashri Fashions would be your best choice. They produce traditional and ethnic wedding dresses and export to European and Asian countries. Rajashri customize the fashion to reflect the fusion of culture among the expatriates outside India. They have a broad spectrum of wedding dresses for brides and party dresses. This is one of the top destinations for wedding dresses in T Nagar for both brides and grooms to cater any kind of requirements. They have an amazing collection of lehenga cholis in different styles and designs. This is situated in Thirumalai road opposite to Vani Mahal which makes it easy to reach there. This is another great place to shop bridal lehengas with brilliant designs. They personalize lehengas to best match your expectation about your dreams about wedding dress. Customer review suggests that they don’t compromise the quality. Pothys is a popular destination for people of all sexes and ages. They have a huge collection of dresses for all kinds of purposes and occasions. Pothys have affordable collections of unstitched and readymade lehenga cholis. This store in the T Nagar would be your best choice if you are in a tight budget. Lehengas in Pothys cost lesser and more than 80% of their total lehengas cost below 10,000 Rs. They have a wide array of enchanting lehenga cholis for a graceful wedding. It is one of the leading store in Chennai selling ethnic clothing boutiques. Kay fashion has 10 stores across Chennai catering the needs of different types of customers. The store in Triplicane is exclusively for sarees and lehengas and here you can find the bridal lehengas of any style and design. Varsidhi has premium selections of bridal lehengas. The also has special collection for bridesmaids. In Varsidhi, you can purchase bridal lehenga along with matching dresses for bridesmaids. The premium designed lehengas will make feel you extra special on your big day. 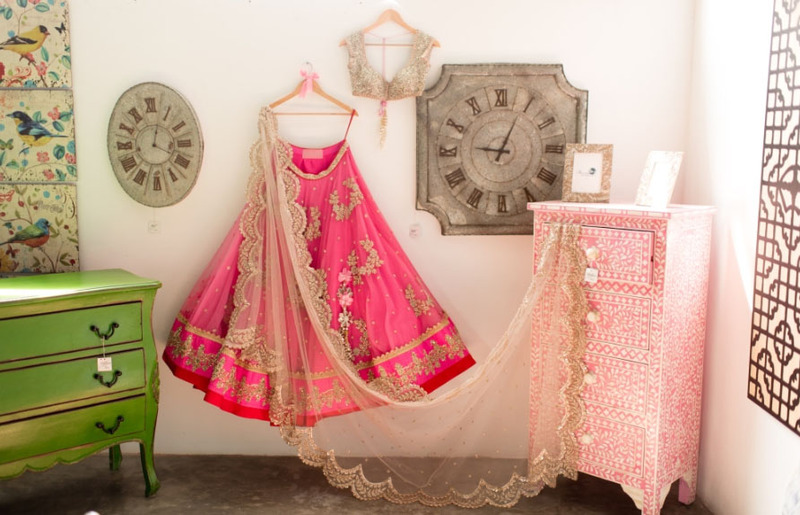 This store, located in Cathedral road, has an elite collection of beautiful designer wedding lehengas. Moksha blends tradition with trends and make lehengas and saris with unique style. Their lehengas can add unmatched grace and enhance the beauty of the bride. They have special collection of premium quality but expensive bridal lehengas to make you look elegant on your big day. These are few top and popular destinations for bridal lehengas in Chennai. You can find the best bridal lehenga for you from any of these shops. Most of them offer customization service which would help you to personalize your lehenga based on your physique and style preferences. Shops like Kataria’s and Nazia Syed have a special team for designing and customizing dresses and they will be the best choice if you want a custom-made lehenga designed based on your personal tastes and preferences.